Powerful, full-featured Fire tabletâ€”with 1 year of Amazon FreeTime Unlimited and a Kid-Proof Caseâ€”for a savings of up to $109â€”plus a 2-year worry-free guarantee. If they break it, we'll replace it. No questions asked. We all know accidents happen. The 2-year worry-free guarantee includes coverage for anything that happens to your Fire tablet. Just return the tablet and we'll replace it for free. It also covers your Fire tablet against electrical and mechanical breakdowns. The Kid-Proof Case is designed to be the perfect solution for parents who need worry-free protection against drops, bumps, and the typical mayhem caused by kids at play. 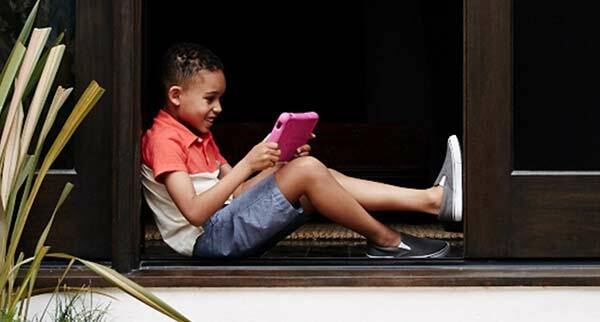 Designed to be durable and lightweight, the Kid-Proof Case fits perfectly in little hands without adding unnecessary weight to their Fire tablet. A full-featured Fire tablet that includes a 1024 x 600 IPS display that's perfect for watching movies like Frozen, plus a fast quad-core processor that ensures quick app launch times and smooth games and video. The Fire Kids Edition tablet comes in black (with a blue, pink, or green Kid-Proof Case), expandable storage capacity up to 128 GB with microSD, and a 7-inch display. Keep your child's photos, movies, games and apps with you using a microSD card slot that lets you expand your tablet's storage by up to 128 GB. Fire Kids Edition has a 2 MP rear-facing camera for taking high-resolution photos and 720p HD video, and a front-facing camera that's perfect for video calls between kids and grandparents. Fire Kids Edition starts in Amazon FreeTime, which is built from the ground up just for kids. The background color and fonts change to a kid-friendly design, they only see the titles that they have access to see, the home screen carousel shows their recently viewed titles, and they can even navigate visually to content based on characters or topics. Parents can create up to four individual child profiles and choose titles from their own collection of content that they want to give each of their kids access to. It's like giving each kid his or her very own, personalized tablet. A child's profile does not have access to in-app purchases, email, or social media features. Parents can take Fire Kids Edition out of Amazon FreeTime using a password. Fine tune settings, download apps, or share kids' drawings with family on Facebook. You can choose specific books, videos, and apps for your child to see in Amazon FreeTime from your library or when you purchase new content from Amazon. 8 or 16 GB of internal storage. Add a microSD card for up to 200 GB of additional storage. 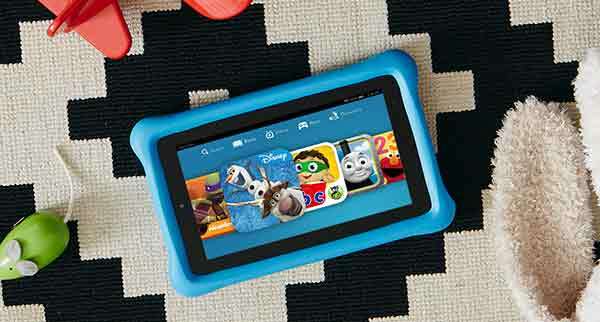 Top Level Categories for Fire Kids Edition Tablet, 7" Display, Wi-Fi, 8 GB, Blue Kid-Proof Case.